Our most frequently asked question is some form of: “I want to rent an office in Bethlehem, find ‘cowork near me,’ or rent a conference room, what do you have available?” And here is the answer –– a list of our current openings. To apply or if you want to discuss your situation, click here. 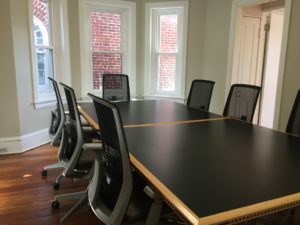 Available April 1, a 775-square foot suite of offices on the first floor of this well cared for Bethlehem building: Four rooms, including lockable offices and a front room that is well-suited as a conference room. In the business district, three blocks from Main Street, and around the corner from the I-378 exit. Beautiful hardwood floors in the two front rooms, which both have doors opening onto the common space front hallway. A back door leads directly to the parking lot, where three parking spaces are allotted to this office suite. Upstairs are a shared kitchenette and the potential to expand your office via the coworking space or by booking the 2nd floor conference room. If you don’t need to rent an office or a desk but want to book our 2nd floor conference room one-time only or occasionally for business meetings, please contact us at info@cowork414.com to discuss. You will need to provide proof of insurance and respect the building rules, such as no smoking on the premises by you or your guests. If you need to use a conference room on a regular basis for business meetings, as a member, you will receive a link to book the conference room directly when you need it. Your membership level will depend on how much you plan to use the conference room. Click here to contact us and we’ll call you to discuss your conference room needs. Yes! 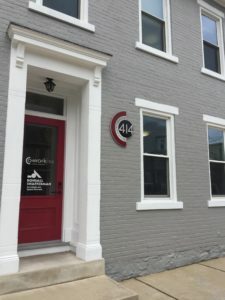 While the above are the main CoWork 414 options to rent an office in Bethlehem, ‘cowork near me,’ or rent a conference room, we understand you may have a different business need. Maybe you want a Bethlehem address to expand your existing business, a home base between sales calls, or are hiring your first employee and need two spaces. Let’s talk! Please click here to contact us and we’ll call you. Or, for details about the membership levels for coworking, click here..